All-welded cabinet are made with 14 gauge steel and angle reinforced perimeter around the door frame. Back wall and doors have louvered panels. Shelf rails allow shelf adjustments at 2-1/2" increments. 14 gauge steel shelves offer 1,000 lb. capacity each. Includes break resistant polyethylene bins. Doors open full 180° and include 3-point locking system with padlockable heavy duty steel chrome finished lever handle. (lock sold separately) Forkliftable. Gray or Black powder coat finish. Deep Doors are 4"D and available with or without shelving. Flush Doors are louvered without shelving. 78"H cabinets include 4"H legs that allow floor anchoring, 84"H Cabinets include 6"H channel legs. Customize your cabinet with additional Stack and Hang Bins. 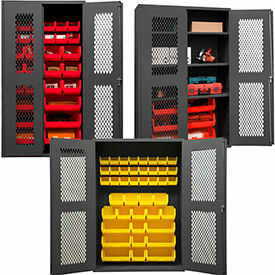 All-Welded 16 Gauge Bin Cabinets Can Be Configured To Organize Storage Space Effectively. All-Welded Bin Cabinets are made of 16 gauge steel to provide long lasting durability. 16 gauge shelves provide storage for heavier items. Leveling guides ensure optimum performance. Several sizes and bin configurations allow for customized organization. Adjustable shelves can be added for convenience. Mounting panels are welded to cabinet back doors for easy installation. Door types include Deep Pocket Door or Flush Door. Available door colors are Blue, Red, Putty and Yellow. Available bin colors are Blue, Red and Yellow. Bin quantities vary from 64 - 264. Dimensions vary per model. 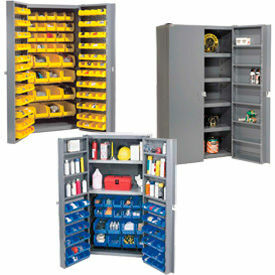 Extra Heavy Duty Bin Cabinets Securely Store Commercial And Industrial Materials, Tools And Supplies. 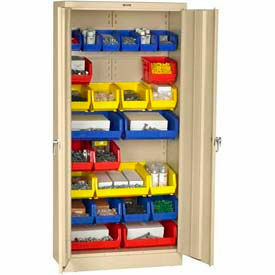 All Welded 12 Gauge Extra Heavy Duty Bin Cabinets are solidly constructed for long lasting durability and dependability. 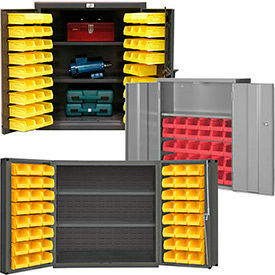 Durham and Stronghold® brands offer a wide selection of heavy duty 12 gauge steel cabinets with gray powder coat finish equipped with impact resistant polypropylene bins for organization and storage of fasteners and other commercial or industrial supplies. A wide range style cabinet available. Choose cabinets which have shelving only in interior with bins on doors, cabinets which have all bins in interior and on doors or cabinets that have bins on doors and a combination of bins and shelving in interior. Bins feature a hopper front opening, label holder and rear hanging lip for easy removal. 3-point locking doors include a padlockable handle for security. Welded steel legs offer floor clearance space for easy cleaning and forklift access. These steel storage cabinets are made with 16 gauge steel for sturdiness and security. Bin cabinets offer an impressive 800 lb. capacity per shelf with a variety of bin and shelf combinations. A wide range of cabinet styles meet your storage needs. Cabinet with bins include reinforced 4" deep box style doors that swing a full 270° on heavy duty hinges and close with locking handles and a cut resistant padlock hasp. Bin cabinets have leveling feet, withstand 250°F and have a gray powder coat finish. Assembled security cabinets are not returnable. Premium, break resistant polypropylene bins compare with the national brand and include reinforced sidewalls, hopper openings and large label areas. These hang bins easily attach and detach from louvered insets. Choose from 3 bin colors: Blue, Red or Yellow. 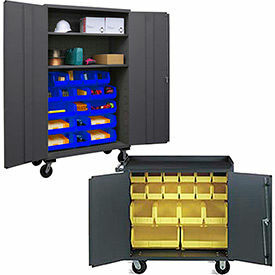 These Locking Bin Security Cabinets Offer Dust Free, Secure and Organized Storage. This collection of storage cabinets offer various combinations of shelf and bin configurations. These cabinets with bins are available with solid door and clear view acrylic doors for a convenient and attractive appearance. Reinforced doors on these bin cabinets open a full 180° for complete access and close securely with a three-point locking system and key lock. Heavy gauge steel shelves are adjustable and feature a 230 lb. capacity. Break resistant polypropylene bins with hopper front opening offer easy viewing and access. Powder coat finish resists chipping and scratching. Choose from assembled or unassembled cabinets. Assembled cabinets are not returnable. Customize your storage with additional bins. 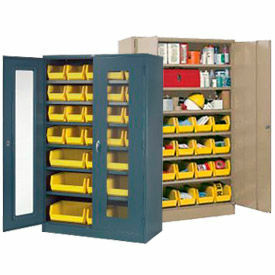 Small Parts Storage Cabinets Securely Hold Small Items For Automobile, Assembly Lines And Other Warehouse Applications. 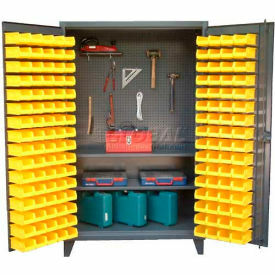 Small Parts Storage Cabinets are made of heavy duty all welded 14 gauge steel for long lasting durability. Fully welded piano hinges provide a door load capacity up to 650 lbs. Includes 3-point locking system with keyed handle and lock rods for additional security. Louvered panels on doors for hang on bins. Cabinets ship fully assembled. 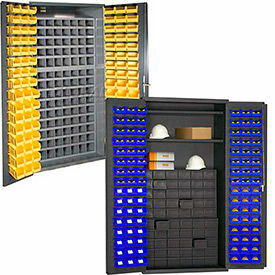 Available 96-bin styles are With Pegboard, With 112 Compartments, and With 60 Drawers. Color finish is Gray Powder Coat. Security Work Centers Organize and Secure Valuable Tools and Parts. Available in a variety of drawers, bin and shelving options. Steel storage cabinets feature reinforced deep pocket doors or flush doors that swing a full 270° for access. Interior surface included for a fully functional workstation. Doors are inset with louvered panels that hold bins, pegboards or shelves. Steel drawers extend completely on full ball bearing suspensions for quiet operation. Drawers with assorted dimensions. Global Models include a cut resistant hasp to protect the Padlock (sold separately). Durable powder coat finish. Ships assembled. 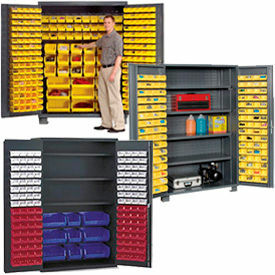 Store And Organize Your Parts And Supplies With These Tilt-Bin Storage Cabinets. Lyon Security Cabinets are made with all welded 14 gauge steel. 7"D doors feature large capacity. Plastic tilt bins with grip handle that conveniently tilt forward to allow access, then tilt back for compact storage. Plastic hang bins are removable for transporting parts to a work site. Doors feature full piano hinges and 4" swivel casters to maintain alignment and provide smooth door operation under heavy loads. 38" W x 21""D full shelves and 16""W x 21" D half shelves adjusts at 3" increments for storing large equipment. 3-point lock mechanism with hasp handle. Forkliftable. All welded cabinets are not returnable. See Thru Heavy Duty Bin Cabinets Offer Durable Closed Storage With Clearview Doors Or Extended Mesh Doors For Viewing Of Contents. Bin cabinets are made using all welded 14 gauge steel with 13 gauge expanded mesh door panels or clearview flush door for easy viewing while maintaining maximum security. Doors include a 3-point system with keyed locking handle or padlockable lever handle (lock sold separately). Doors open 180° for full access to contents. Louvered back panel easily stores included plastic hanging bins. Some models include 4"H legged cabinets that are forklift accessible. Powder coat finish. Cabinet with Drawers includes 16"W x 20"D x 5"H locking drawers with 2 keys. 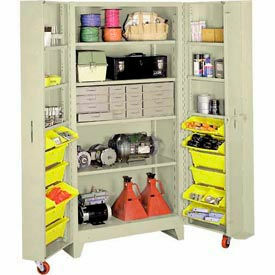 Cabinet with Shelves includes two 14 gauge reinforced shelves that offer a 700 to 1,000 lb. shelf capacity. Shelves are height adjustable at 2-1/2" increments. Akro-Mils Quick-View Doors are made of 16-gauge steel for long lasting durability. Gray cabinet with steel wire mesh door panels or Beige cabinet with break-resistant, see-through Lexan inserts. The powder coat paint finish resists cuts and scratches. Louvers on back walls. Flush, see-through Lexan door panels. Industrial strength lock and key ensure complete security. Tennsco Welded Bin Cabinets With 8 Bin Rails Are Used For Storing And Securing Hardware, Supplies Or Other Tools. Tennsco Welded Bin Cabinets are made of all welded steel for long lasting durability. 3 point lock, knuckle hinges and 16 gauge frame provide added security for contents. Leveling glides and back louvered panel provide added stability. Bins may be up to 15" deep in 18" d cabinets and loaded weights must not exceed 30 lbs per rail cap. Bins not included. Colors are Light Grey, Black, Medium Grey, Sand and Putty. These Bin Cabinets Easily Mount Up Against A Wall Or Be Used As A Work Bench For Convenient Storage And Easy Access. Wall Mount Cabinets help keeps small parts organized and out of the way. Bench Height Cabinets are designed to fit in small area, or be used as a work bench. Bin storage cabinets are made using heavy duty all welded steel. Louvered back panel allows easy hanging of included plastic bins. Plastic bins can be stacked or hung on louvered panel for quick and easy access to small parts and supplies. All-Welded Mobile Bin Carts Provide A Convenient Mobile Work Surface And Storage For Parts, Tools And More. All-Welded Mobile Bin Carts are constructed using heavy gauge steel for long lasting durability. Locking doors offer secure storage. Two rigid, two swivel casters roll smoothly over rough surfaces. Available with various combinations of drawers, doors, bins, panels and shelves. Dimensions vary per model. 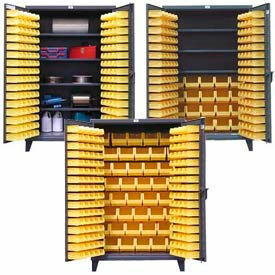 Stronghold® Tool And Parts Storage Bin Cabinets Are Designed For Small Equipment, Parts And Other Jobsite Materials Storage And Organization. 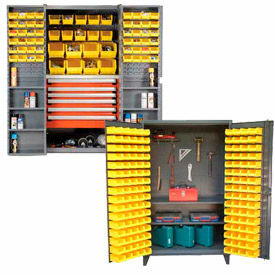 Stronghold® Tool And Parts Storage Bin Cabinets are constructed of 12-gauge steel for long lasting durability and strength. 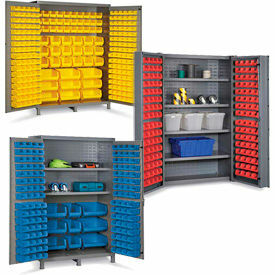 Includes 94 or 144 small bins on doors, a pegboard back, and 2 shelves for versatility of storage options. Color finish is Dark Gray. Bin color is Yellow. Shelf capacities are 850 and 1900 lbs. Includes 1 Year Limited Warranty. Dimensions vary per model.